Gambling is illegal in most states: San Diego State is an 8-point favorite. Top of the Mountain: The MWC has four teams with one loss jammed atop the conference, meaning Saturday’s game could serve as a title eliminator of sorts. Fresno State and Boise State also have one loss. Air Force won’t play Boise and will face Fresno to end its regular season Nov. 24; SDSU upset Boise on the blue turf last week and lost to Fresno earlier in the season. Possible bright spot for the Falcons: The key tiebreakers involve head-to-head performance, so an early loss to UNLV might not prove too costly. Thanks to this Bleacher Report columnist for tracking down the particulars, but the path for Air Force is simple — win and they’re in, lose once and they’ll need plenty of help. Common (non-MWC) opponents: SDSU throttled Army 42-7 in September. Air Force … well … the 41-21 loss last week was the worst the Falcons have suffered this season and the most p0ints they’ve allowed. Scouting SDSU: First thing really is first — return man Colin Lockett took the opening kickoff 100 yards for a score against Boise State last week, his second TD return of the year (he did it to Army earlier) and third of his career. The running game is key for SDSU, with sophomore Adam Muema already topping 1,000 yards for the year. Quarterback Adam Dingwell threw only 18 passes against Boise, completing 12, but the sophomore’s got quite the prep pedigree. The defense held Boise to less than 300 total yards and only 112 yards on the ground last week. Getz is back …? 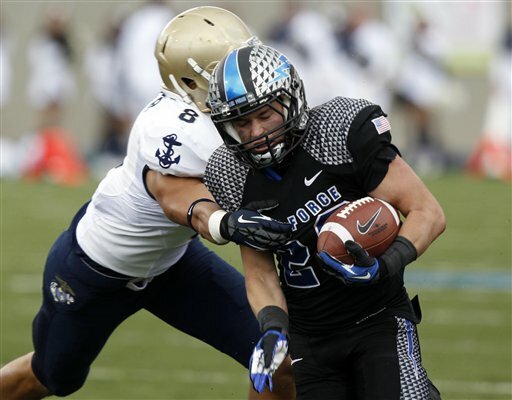 : Senior running back Cody Getz returned to the lineup last weekend against Army, but his numbers didn’t match what he’d done before his ankle injury. Getz had 14 carries for 23 yards and didn’t top six yards on any single rush. He’s still averaging 7.0 yards per carry on the year thanks to his explosive start; for the Falcons’ attack to refire, he’ll need to break off a few long runs while Wes Cobb continues carrying the load, along with run-pass threat Connor Dietz. More on the Falcons’ run-game struggles here. Odds and ends: A silver anniversary award for College Football Hall of Famer Chad Hennings. … The football game won’t be the only military-themed event featuring SDSU this weekend. … Air Force wideout Chris Jordan joins four other MWC players in earning regional Academic All-America honors.